A game designer is a combination of a programmer and an artist. A preacher is a philosopher and a dreamer combined. Meld a magician and a scientist and you have a wizard. This is how the world works in LambdaMu Games' Pixel People—simple, elegant and endlessly entertaining. The planet Earth is gone, the sole remaining trace of humanity a gene bank floating in the endless void of space, waiting for the hand of god (that's you) to tap it to life. It all starts with a mayor, who runs the joint, and a mechanic that maintains the genetic research facility. Combining those creates an engineer, who runs the Utopium mine, pumping out this free-to-play world's version of in-game currency on a daily basis. Combine the mechanic with himself and you have an assistant, the mayor's aide. Combine the mayor twice and you get a sheriff. Combine the sheriff and the assistant and you have a deputy. This is how you build your Pixel People world. 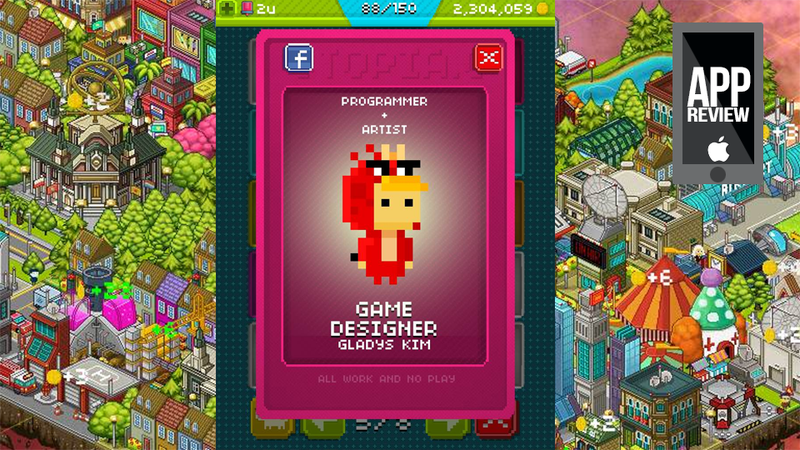 It's like a mix of Tiny Tower and Doodle God, combining elements to unlock new ones. Many jobs unlock new buildings—the sheriff's office, for example—expanding your world. Some of these buildings have special functions—the observatory lets you change the floating city's position in space, while the police station is where you view the game's achievements. You're not going to unlock all of Pixel People's 150 professions in one sitting. Space is at a premium. You need spaces for houses, as every new Pixel Person needs a place to live. You need spaces for the new buildings created with new professions. Run out of space and you'll have to wait until your existing buildings generate enough cash to purchase more. I've been playing Pixel People for a week now. The first few days I couldn't put it down, eagerly anticipating each new uncovered combination, collecting hearts for bonus cash and collectible pets, making sure my buildings were all supplied with enough energy to keep generating funds. I decorated a little, adding some waterways and roads before deciding I'd save decorating for once I unlocked all the professions the game has to offer. Now the game has slowed down considerably. I have 88 of 150 professions unlocked, I'm out of usable land and I'm a million credits away from my next land upgrade. All I can do is maintain my city's energy to generate cash. I should be disappointed by this turn of events, but I'm not. Pixel People is a game about experimentation and the joy of discovery, and while it'll be quite a while before my next clone is spliced, I'm still just as excited about it as I was the first 88.